This book promises to bring an end to all of that. It’s a cookbook, yes, but it’s so much more. 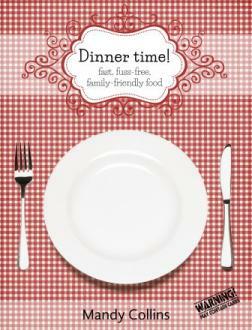 It’s a family feeding system that promises to take the guesswork out of daily dinners. There are 28 days’ worth of easy, quick recipes, many of which come with variations, plus a host of extra recipes that can be thrown together from ingredients you probably have in your cupboard already. There are hints and tips and shortcuts that will make life easy for even the most kitchen-phobic, grudging cook. There are even weekly shopping lists so you can be sure you have everything you need. Written by a working mother who knows just how stressful the daily cook can be, this book is accessible, practical and easy to use. The emphasis is on getting the job done as efficiently – and deliciously – as possible. And the recipes are easy enough so that even teenagers or less proficient cooks can whip up a tasty meal. Mandy Collins will hold your hand every step of the way with her chatty, reassuring advice, and before you know it you’ll be turning out scrumptious dinners without even breaking a sweat.